The grounding of the UK Royal Navy’s nuclear-powered submarine, HMS Astute (S119) off the west coast of Scotland two years ago, was due to a catalogue of errors, an official report has claimed. The submarine was stranded for 10 hours during a boat-to-boat personnel transfer as part its first set of sea trials off the Isle of Skye on 22 October 2010. The Royal Navy investigation revealed that the catalogue of errors were found due to "no dedicated plan or briefing" for the transfer and the Navy has accepted the results of the board of inquiry. "The root causes of the grounding were non-adherence to correct procedures for the planning and execution of the navigation combined with a significant lack of appreciation by the officer of the watch (OOW) of the proximity of danger," the report revealed. The report also said that a number of additional causal factors were present, including some equipment deficiencies in addition to poor planning and communications, combined with a failure to adhere to the correct procedures of HMS Astute. The 93m-long, 11.3m-wide submarine has a maximum submerged displacement of 7,400t, can cruise at a submerged speed of 54km/h, accommodate a crew of 98 and is equipped with Spearfish torpedoes. Powered by a nuclear reactor, the submarine can operate for 25 years without refuelling, allows for submerged patrols of up to 90 days and can remain undetected. Built by BAE Systems, the submarine was designed to undertake a variety of missions upon commissioning that included anti-ship and anti-submarine missions, intelligence gathering and support for land forces. Astute, which returned to its homeport in Scotland, UK, will now undergo a base maintenance period at Faslane Naval base, UK, following sea trials later in 2012. 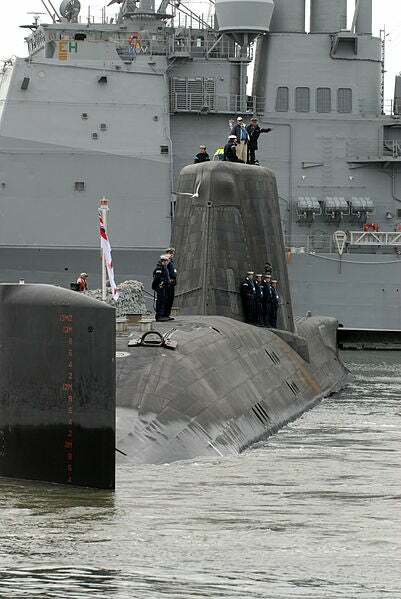 Image: HMS Astute (S119) submarine manoeuvred into position upon its arrival at Naval Station Norfolk. Photo: Todd A. Schaffer.